not cut your walls in half. Followed closely by that is to not create an obvious dividing line between the walls and the ceiling. Let’s take a look at what these mean. The first order of the day are the windows. Because they interrupt the flow between the wall and the ceiling, they have a tendency to cut the walls into sections. This can be remedied by creating the illusion that the windows extend all the way to the ceiling. Mount window treatments just below the ceiling and let them hang all the way to the floor. Use blinds to hide the ceiling that shows between the top of the window and the ceiling. If you have a bigger budget, consider adding transoms above the windows to extend them all the way to ceiling. It will not only let in more light, but will make the walls look taller and the ceiling higher. Use a similar color for both the walls and the ceiling. Doing so prevents the ceiling from having a distinct separation line. This will make the room feel more spacious and open . This room is a perfect example of how color can help to raise a ceiling. They have kept the walls and the ceilings the same. Instead of using color, they have added interest and texture to the ceiling by using planks. Also, using monochromatic colors for the rug and the bedding allows everything to flow without any drastic color changes to visually interrupt the sight line. Even the crown molding and base boards are sporting the same shade. Another way to make walls look taller, and thereby make the ceiling seem higher is to keep everything vertical. When furniture and art is taller than it is wide, it creates the illusion of height. The bigger the difference between the length verses the width, the greater this effect will be. 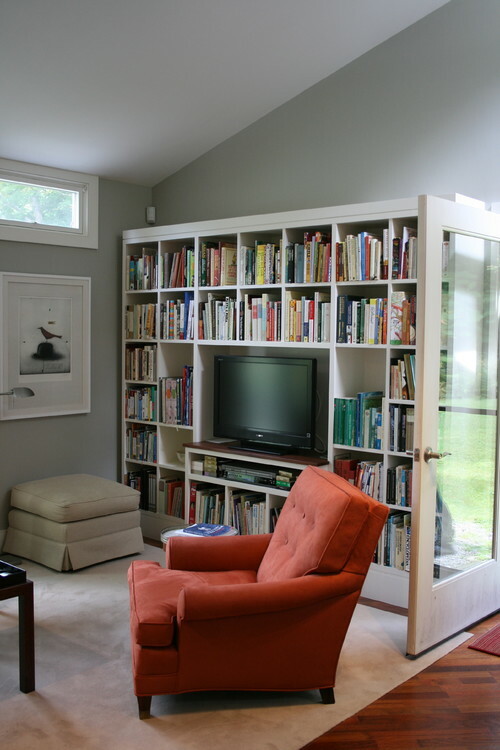 This door and bookcase are examples of great ways to create the illusion of height. The doors are full length, meaning they extend almost all the way to the ceiling. Average doors are just 6 1/2 feet high, but doors can also be installed at 8 feet high. With trim, an 8′ door can be extended almost as high as 9′. 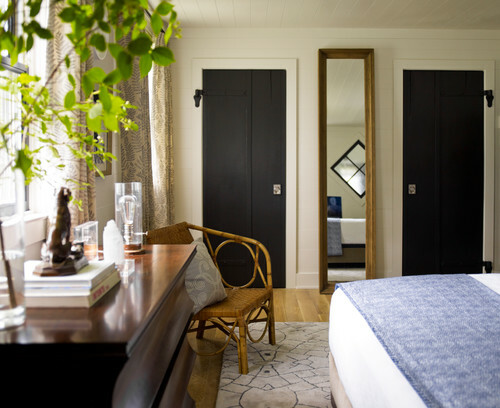 Another example of using decor to raise the ceiling – here they already have full length doors installed. But, they went a step further by adding a tall, but narrow, mirror to the mix. Already have standard size doors and can’t change them? Well, just add some trim to make the doors appear taller. Another great way to keep doors from cutting into your wall height is to paint them the same color as the walls. Even though monochromatic colors are recommended, there is no reason that a feature wall can’t be included. Just make sure that the feature wall maintains the vertical flow. 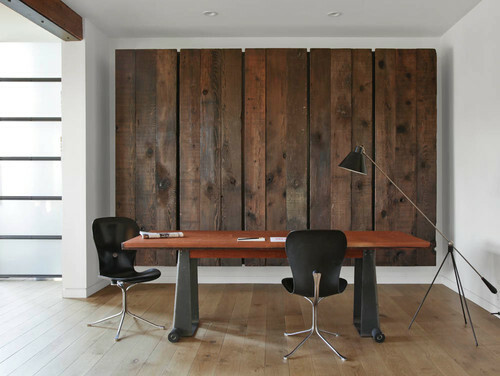 Here, a plank wood wall is done with the boards placed vertically as opposed to the traditional horizontal installation. Again, we see the rule of length vs width being played out. So that everyone can see a few examples of rule breakers, I am including a few rooms that demonstrate what not to do. Although a perfectly lovely room, this bedroom has had it’s walls cut in several places. First, the window visually lowers the ceiling, and nothing has been done to remedy this problem. In addition, let’s take a look at what they have done with the paint color. They have a very nice tray ceiling. However, in an attempt to accent this architectural feature, they have created a space that feels more confining than it needs to be. Notice how the wall color is added to the inside of the tray, while the rest of the tray is finished in flat white. By painting the tray in this fashion, they have lost the opportunity to create more height. (This would be perfectly acceptable with a higher ceiling, or if your intention is to lower the ceiling). In comparison, this very similar room seems to have a higher ceiling simple because it is painted with the intention of raising the ceiling. Here the wall color continues all the way to the top level of the tray. By doing this, the ceiling of the tray can become a feature with an accent color. This both raises the ceiling, and still lets the owner show off the architectural detailing of the ceiling. Another common mistake is when a chandelier is added to a low ceiling. In this image above, the room is very nice. However, the chandelier makes the ceiling height obvious. It hangs about 12″ lower than is ideal for this space. 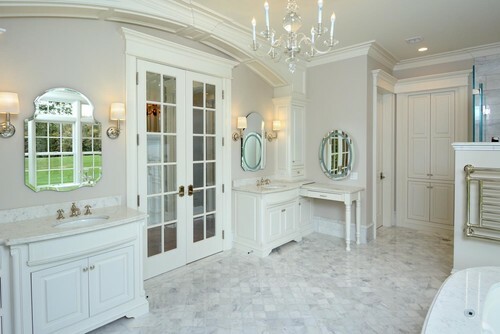 Here, a better choice has been made with a semi flush chandelier. 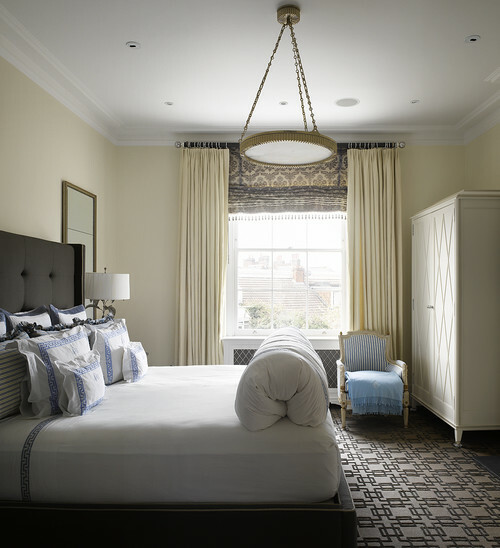 They also have added a few other features that visually raise the ceiling – the vertical panels behind the bed, built-ins that extend all the way up, and drapes hung just below the crown molding. Since I pointed out why full length doors and ceiling height bookcases are so important, I wanted to include an image of a rule breaker. In this picture above, the walls seem very short, however if you look closely, you can see that the ceiling is actually quite high. They have done the exact opposite of what I recommend for raising a ceiling, and by doing so, they have created the illusion of a low ceiling and closed off the space. First, the bookcase visually cuts the wall in half. Secondly, they have further compounded the result by placing it next to an average height door. 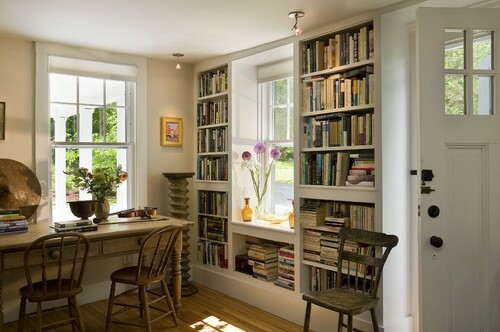 In comparison, this room has a full height door and the bookcases are built all the way up. 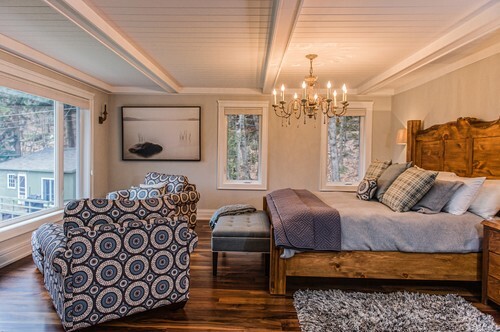 You would never guess that this room has a ceiling height that is lower than the room above. So, how do you create the illusion of high ceilings in your home? Some of these tips can be easily implemented into a design, while others are obviously more appropriate for an in-depth renovation. But, when the time comes, maybe you will be able to use some of these suggestions to achieve your desired results.